"You inspired me to quit my job to make indie games!" For those of you new to this blog, my name is Lars Doucet, I'm an independent game developer, and my company Level Up Labs has been pretty successful. We started with a simple but compelling little game, Defender's Quest: Valley of the Forgotten, which we sold direct over the web for almost a year before clawing our way onto Steam, and wound up doing better in the second year of release than the first. At last count, we've sold about 195,000 copies. I'm elated at this success, but it also fills me with some discomfort. For one, I know that I'm one of the lucky few indies who ever succeed at making a living doing what they love. And for some further perspective, even with our much-hyped success, our company can still only afford one full-time employee -- me. Everyone else moonlights part-time or is an external contractor. To put it in baseball terms, if Braid was a home run and MineCraft a grand-slam, Defender's Quest would be a solid base hit. So in a field like games with such an astronomical strike-out rate, it terrifies me whenever I find out I've inspired another rookie to go all-in. 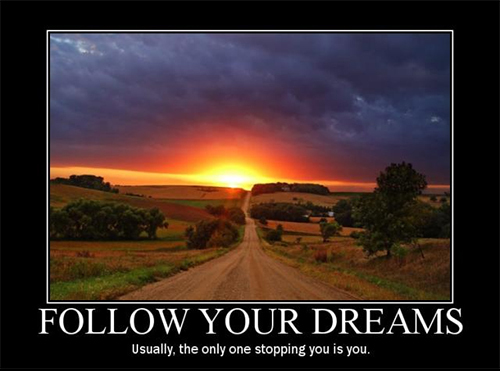 Follow Your Dreams!... or Maybe Don't. Following your dreams is crazy, scary, fraught with risk, and the kicker is ... you might not even want it as much as you think you do. What is your dream, really? I want to be on ESPN! I want to do broadcast journalism on (Fox News/MSNBC/CNN)! And so on. Teenagers tend to focus on forward-facing jobs modelled in popular media. Likewise, if you ask children what career they aspire to, they'll say "firefighter," "astronaut", or "police officer," or any other Richard Scarry jobs that they see modeled in the toys they play with. And God help the kids who want to be models and actors. Have you seen those documentaries? The catch is that there's some selective memory involved in my personal history. I also wanted to be a science fiction/fantasy writer, a cartoonist, a fine artist, a 3D-modeller, an animator. I still have tons of creative material from all those different fields stashed away in a closet at my mom's house, or on forgotten hard drives. I got my Bachelor's in Architecture of all things, and my Master's in "Visualization Sciences", which is a fancy word for "I want to work for Pixar." When I reached adulthood and finally had the chance to try my hand at these careers, I tried them -- all of them, and to my surprise, I hated them. It wasn't just that I sucked, couldn't hack it, and quit -- it's that none of these things were nearly as fulfilling or interesting in real life as they had been in my head, and I found I just didn't love them enough to get over the hump of getting good at them. And then I realized -- that's okay. Why should I kill myself trying to get a job I know I'll hate just to keep a promise to my 8-year old self? Even more ironically, actually becoming a game developer required me to dive into a world my eight-year old self was sure to hate: programming. I desperately wanted to makes games, but I did not want to be a programmer. Oh sure, somewhere along the line I figured out programming was necessary if you wanted to make games, so forced myself to learn C, C++, Java, ActionScript, and all the rest. But that wasn't my real vocation, that was just some bad medicine I forced down to get there. Years later, all I do is programming. Except for when I'm doing business stuff like quarterly reports, taxes, invoices, balancing the budget, vetting contractors, etc. Making games is nothing like I imagined it would be, and strangely enough, I love it! Nothing puts this difference between expectations and reality in sharper contrast than reflecting on Defender's Quest. When I was a kid, my big dream was to make an Epic Fantasy RPGTM called Secret of the Dragons (or whatever). I still have a notebook filled with ideas for it, which I see now as an amalgam of random ideas stolen directly from Quest for Glory, Final Fantasy I-VI, and Secret of Mana. When I was finally old enough to make Secret of the Dragons, I thought to myself, I would write these great characters, tell an awesome story, draw lots of amazing art, and intricately design all the game systems. It was going to be awesome. Just you wait and see! Instead I formed a small team that made Defender's Quest, and other people wound up doing those "creative" jobs I craved as a kid. James Cavin created the story and characters, Anthony Pecorella designed the game systems, and Karen Petrasko, Tyvon Thomas, Zhi Jiang, and James did the art. To be fair, I had a ton of influence on the design, and since I was the one actually implementing the ideas my vision touched every corner of the game. Still, my point remains -- the experience was basically the exact opposite of what I imagined as a child. Sometimes when I look at DQ it feels "mundane" compared to Secret of the Dragons. It doesn't have a walkable overworld map and dungeons filled with treasure like Final Fantasy, it doesn't have Quest for Glory's immersive sense of place, and it doesn't have Secret of Mana's expansive, proto-open-world feel. I mean, it doesn't even have ONE team of humanoid dragons that fuse into a giant three-headed magical hydra that shoots green fire at an awesome skeleton boss. But you know what? I think Defender's Quest is pretty great, and unlike Secret of the Dragons, it actually exists. So I guess that's my first point. Dreams are intangible, and what you actually achieve will probably be very different, for better or for worse. My next point is that there are dark forces in the world that prey on young Dreamers. Thanks! 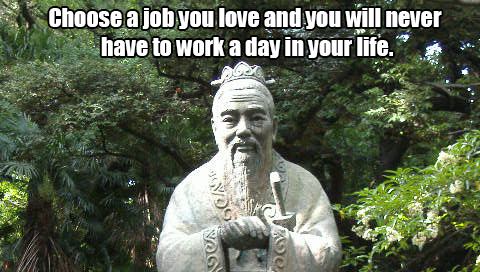 Got an opening for "Legendary Chinese Philosopher?" So not debt, illness, obligations, economic meltdown or bad luck? When I was a kid my family spent some time in thrall to a Multi-Level-Marketing cult with a penchant for dream rhetoric. Years after my parents escaped, I looked back and realized statements like "Never Quit following your Dream!" easily translate to: "Sacrifice your money, your youth, your health, your friends, all for some arbitrary goal!" This Multi-Level-Marketing cult would encourage members to "Dream-build." Come on, let's go look at fancy cars and Yachts, you'll have one someday. Pick out one you like, take a picture. Imagine your dream-home, draw the plans, pick an architect. Put that picture on the fridge, that's your DreamTM. How will you succeed without a DreamTM? Now while you're working hard hawking laundry detergent and vitamins to your downline on your independent small business, I've got some new motivational business tapes for you to listen to. I know you just bought a bunch last week, but don't worry about that, it's an investment in your business and your Dream!TM Just think, without your DreamTM you'd be working for The Man in a dead-end job like all your deeply concerned friends and family those negative sheeple who keep telling you to quit this business! It seems silly now, but don't dismiss it - I know first-hand how captivating this rhetoric can be for children and adults alike, especially for people disillusioned with the world and yearning with ambition. Okay, so you may not be trapped in a legal pyramid scheme, but if you want to get into game development these days, there's still a lot of shady folks out there who have every incentive to pump your head full of DreamTM and harvest your blood and sweat. I'm not saying every school and company is out to get you, but be on guard. The voice encouraging you to give it "everything you've got" may actually be more interested in "everything you've got" than in your well-being. Being a game developer is pretty cool, but it's really hard to pull off and it may not even be what you really want out of life. If it is really important to you, then I definitely encourage you to try, but surely not at "any cost." How much are you willing to sacrifice? Only you can answer that. But I think it's smart to draw a line in the sand, say "this much, no further." Defender's Quest was my one big risk, and it happened to pay off, but if it hadn't I was fully prepared to go back to being a contractor, and there's absolutely nothing wrong with that. It's hard enough to make a living in this economy, so if you're going to commit yourself to a specific career, do it with your eyes open.